Raith Rovers manager Ray McKinnon believes that squad rotation could be the key to maintaining the club’s good start to the season. 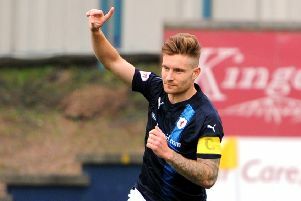 With Ross Callachan back in full training, and Craig Barr featuring in a bounce match this week, Raith are nearing full strength, barring the long-term injured Lewis Vaughan. Maintaining form throughout the dark winter months has been a challenge for Rovers in recent years, but McKinnon plans to utilise his full squad in an attempt to keep his players fresh for the challenges ahead. “We will have to rotate the squad,” McKinnon said. “We can’t keeping going with the same players every week. “The boys have done well, but it’s a long season and we’ve got a good squad when everyone is fit. Raith head to Livingston on Saturday looking to bounce back from their first home defeat of the season against Hibs, a match where Raith felt hard done to by the referee. McKinnon was dismayed by George Salmond’s decision not to award his side a penalty kick for handball as they pushed for a late equaliser. “That’s twice we’ve played Hibs and twice we’ve had a stonewall penalty kick turned down at a crucial period in the game,” he said. The Raith manager was, however, pleased with his own side’s performance as they almost fought back from 2-0 down to rescue a point. “I say this all the time but the players give everything in every game,” McKinnon said. “We’ll get games like Saturdays when we play well and deserve something from the game, and get nothing. Raith face a Livingston side who are 14 points worse off, and currently sit second bottom in the Championship. However, Saturday’s host will approach the match in positive mood after their 4-1 victory down at Queen of the South - a result that did not surprise McKinnon. “They are better than their league position suggests,” said the Raith boss. “We’ve had them watched numerous times and we’ve been impressed. They have a good, strong spine to their team and similar to Hibs they’ve been playing a back three, so they’re going to be hard to beat. Raith were relieved this week to learn that the injury picked up by on-loan Dundee striker Craig Wighton against Hibs is not as bad as first feared and he is expected to return to training as early as next week. McKinnon added: “It looked a really bad one and the doctor thought it was a cruciate injury because of the swelling. Raith will play back-to-back away games on Friday nights in December after matches were moved for live BBC Alba coverage. Rovers will travel to Dumfries on Friday, December 11 to take on QotS before travelling to Greenock seven days later to face Morton. Both matches kick-off at 7.45 pm.